I created all of you for My pleasure - that I might know you, and you Me. I rejoice in you when you spend time with Me, when you take time from your busy schedules to linger in My presence. My children, you are troubled by many cares on many sides, but I am all you need. Knowledge of My Word and time with Me will solve every problem, every difficulty you have. I love you with an everlasting love, not as the world loves, or those in the world love do I love you, but a love without end. In Me, there is no turning, no changing, no unfaithfulness. In Me, there is no fear of loss or regret. Spending time in My presence always brings reward. You will reap benefits you never dreamed if you will only focus on Me, your King. If I am your Lord, then worship Me. If I am your beloved, come into My presence and love Me. If you truly reverence Me, come into My presence and show Me your reverence, and I shall show you great and mighty things you know not of. My children, eye has not seen, nor ear heard the greatness of what I desire to do for you all. Do you not know that I always save the best for last? Do you think I will abandon you in your time of need? Do you expect Me to be unfaithful and deceiving like those in the world? I am a faithful and a loving God. I desire you would come into My presence and pour your love and reverence out in worship to Me. Come and show Me your love, My beloved, and let Me show you Mine. Song of Solomon 2:10: My beloved spake, and said unto me, Rise up, my love, my fair one, and come away. The book will also be available on Amazon.com in a week or so. My thanks to those of you who were covering this project in prayer over the months it took to bring it to completion. It is My time for many of you to step into the ministry roles to which I have called you, and for which I have been preparing you through your lives. You know that I have called and appointed you to this time, but many of you are still holding back from My plan. I desire you to release your cares to Me and obey Me. As you step out, your provision shall appear and you will see it was Me who provided for you. I will teach you to walk in the flow of My Spirit in this, as you will need this more and more as time progresses. The world, so full of sin, is becoming a dangerous place for My people, but those who walk close to Me shall have no fear. Nothing can touch you that I do not allow, My people, but what is allowed often depends on you. It depends on your obedience to My word, to your walking in purity, to you listening and obeying all I say to you each day. What I allow in each of your lives depends on what I have called each of you to do. Many say all evil comes from Me, but this is not so. The Evil One roams throughout the earth, seeking whom he may devour. You know this from My Holy Word, but it is you who gives place to him that devours, My children. Do you not see? Do you not understand? The whole of My Word is your protection from him. If you obey all I say to you to do, and abstain from evil, how much easier your lives would all be, for then he would have nothing in you. It is up to you, My children, to resist him, to flee temptation. If you insist on moving towards temptation instead of away from it, you shall indeed be tempted and tried by the Evil One. If you play long in the world, he will devour all you have. He longs to take from you - to devour houses, families, finances, health and friendships. Do you not know he seeks to steal your very soul from you? Do you not see the chains he brings to bind you with? Run, My children! Run to Me and be safe! Come under My mighty wings of protection and be safe by obeying all I say. Habakkuk 2:3: For the vision is yet for an appointed time, but at the end it shall speak, and not lie: though it tarry, wait for it; because it will surely come, it will not tarry. John 14:30: Hereafter I will not talk much with you: for the prince of this world cometh, and hath nothing in me. Psalm 91:4: He shall cover thee with his feathers, and under his wings shalt thou trust: his truth shall be thy shield and buckler. Over the past year, I have received many requests to compile the prophecies from the Wings site into a book, as many re-read the prophecies often. In taking this request before the Lord, He confirmed it was indeed His will this be done. With the help of my good friend, Rudolph C. Schafer, the Wings of Prophecy book has become a reality. 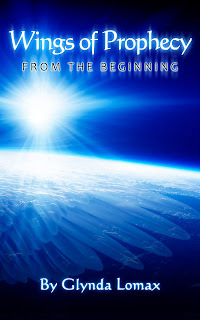 The Wings of Prophecy - From the Beginning book was just released in Kindle version on Amazon.com. It contains all the prophecies from Wings of Prophecy from the very beginning of the site through Fortify Yourselves, released on July 5, 2012. The print version of the book will be out within a week. Events are heating up on the world scene, My children, and conditions are about to get very bad in some areas. (I saw He meant some areas of the world) Hold on to your faith in Me, no matter what you see transpiring around you, for nothing matters in the end if you fail to keep that. I will be speaking to some of you soon about ministries you are to begin doing. I wish My gospel to be preached to the lost, that they be given one more chance to repent while there is yet time. Time is quickly running out and there is no time for turning back or turning away from Me. You must guard your hearts with all diligence, for much of what you see will incite fear in you, and you shall be tempted to stop believing in Me. The enemy will try to make the most of this. When this happens, remind yourselves of all that was foretold in My Holy Word, and realize what you are seeing is simply the fulfillment of My promises about the end. Those who endure, believing, will be greatly rewarded. You have been chosen to live in this time, My children. Only the very strongest can survive in what is coming. The strongest in Me, not in yourselves. Fortify yourselves in My Holy Word and get ready to do battle. Be armed and ready to do battle in your houses against the evil that is coming for you. Be ready to battle the onslaught of temptations the enemy is launching on you. Realize he desires to weaken you by getting you off track. As he distracts you, he steals My Word from your hearts and minds and renders you unprepared to fight his next attack on you, on your household. Get ready to do battle in your cities, for every city in every nation will be attacked by the enemy's forces in this time. Those evidencing My glory will be hardest hit. He will show no mercy, My children, but those of you who prepare by soaking up My Word, by knowing Me, by sitting in My presence daily, and seeking Me, shall walk through this time unafraid and I shall use you to do mighty exploits among your brethren. Unbelievers will watch in awe at My mighty power evidenced through you as I perform feats never before witnessed on earth. The time of My glory has come. Do not waste it being fearful or distracted. Use it. Use it to witness of My greatness, My great power and majesty in the earth, that more souls may come into My Kingdom. Matthew 10:22: And ye shall be hated of all men for my name's sake: but he that endureth to the end shall be saved.